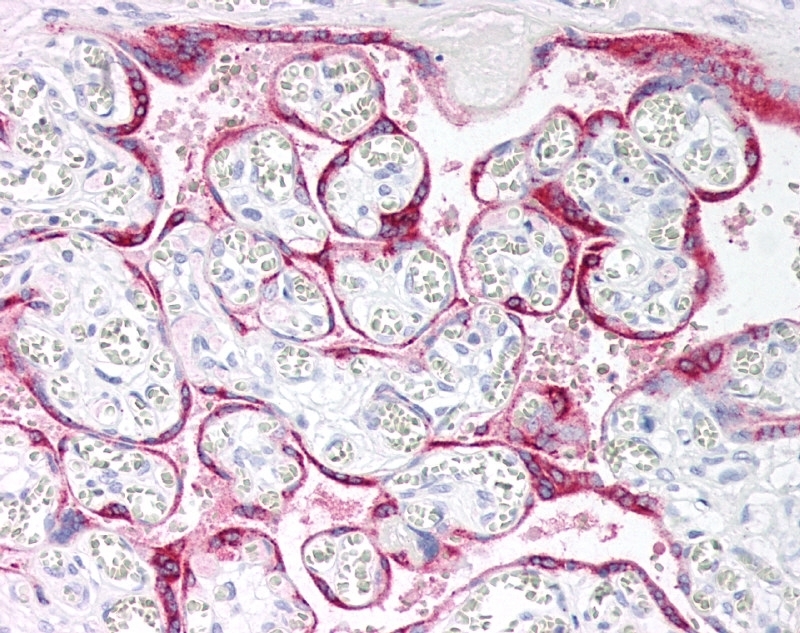 FFPE human placenta stained with Mouse Anti-Human hCG (Alpha 2 Epitope) (MCA1025), biotinylated Anti-Mouse IgG and Streptavidin Alkaline Phosphatase (red). Nuclei were counterstained with hematoxylin. Mouse anti hCG (alpha 2 Epitope) antibody, clone INN-hFSH 100 recognizes the a&lpha;2 epitope expressed on the common subunit of human CG, LLH, LFSH and LTSH. Spleen cells from immunised mice were fused with cells of the mouse X63-Ag8.653 myeloma cell line. Van den Steen, P. et al. (1997) Immunoreactivity for the alpha-subunit of the pituitary glycoprotein hormones in pulmonary neuroendocrine cells of developing human lung and various perinatal diseases.